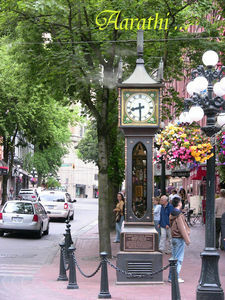 The Gastown Steam Clock, Vancouver. Gastown was Vancouver's first downtown named after "Gassy Jack", a steamboat captain who arrived in 1867 to open a saloon. Gastown's most famous landmark is it's steam powered clock. This glass & bronze clock plays the chimes of Big Ben every quarter hour . Commentaires sur The Gastown Steam Clock, Vancouver.